KANSAS CITY, Kan. – Overcoming obstacles in the XFINITY Series is commonplace for Kyle Busch. In Saturday’s Kansas Lottery 300 at Kansas Speedway, Busch brushed aside a pit road speeding penalty, a hole in the nose of his No. 54 Toyota, a pit stop that dropped him to seventh for the penultimate restart, an unwelcome green-white-checkered-flag restart and a teammate who had the fastest car for much of the afternoon. 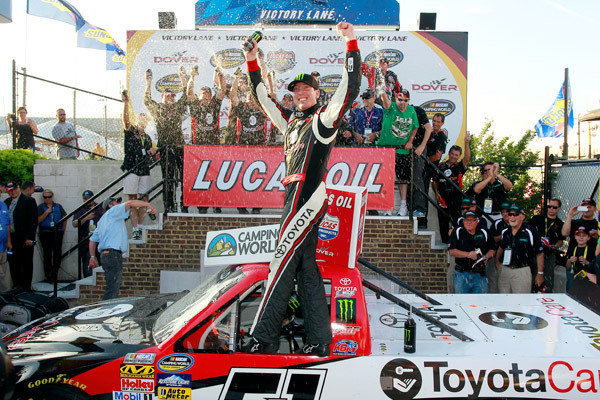 The end result was Busch’s 75th XFINITY Series victory, extending his own record. Busch won for third time at Kansas and for the fifth time in 20 starts this season. The race also saw Chris Buescher add one point to his series lead over Chase Elliott. Though both drivers had issues — Elliott a wreck during qualifying that sent him to a backup car and the back of the field; and Buescher a pit road speeding penalty — Buescher won a drag race to the stripe to come home sixth to Elliott’s seventh and leads the standings by 27 points over the defending champion. But the final 43 laps of the event were vintage Kyle Busch. Restarting seventh on Lap 157 after the seventh caution of the afternoon, Busch surged into second place in a single lap. For the next 28 circuits he harried teammate and eventual runner-up Matt Kenseth before clearing his Joe Gibbs Racing teammate through Turn 4 on Lap 185. Busch survived a green-white-checkered after Joey Gase’s engine blew and oiled the 1.5-mile track with five laps left. Picking the outside lane, Busch cleared Kenseth entering the first turn and pulled away to win by .607 seconds. 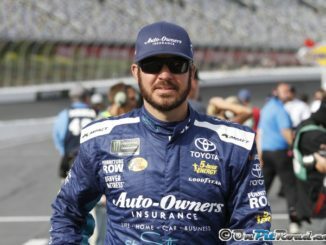 “I wasn’t sure we had enough for that 20 car (Kenseth) today, but there at the end of the race, the track was cooling down and certainly getting freer and it looked like Kenseth just was too loose,” Busch said. 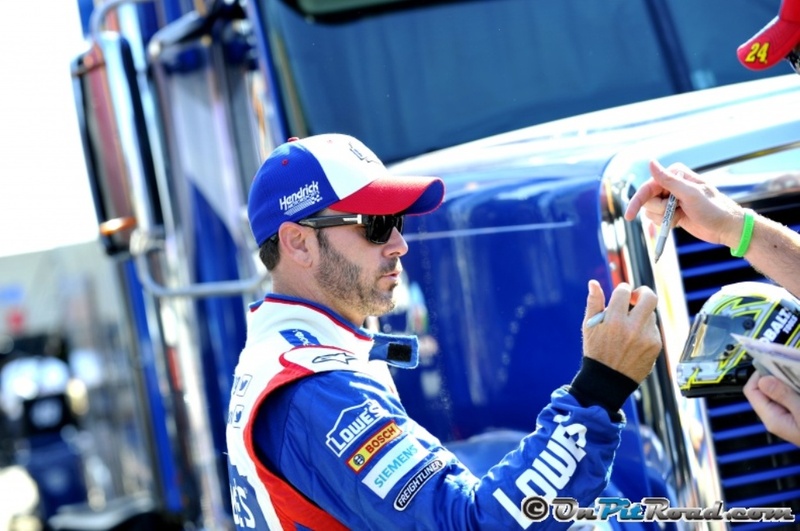 “And I was able to really get the gas down and drive real hard and had a good car to stick through the corner. Kenseth suffered a loose handling condition late in the race and couldn’t keep Busch behind him. “It’s frustrating to get beat again,” said Kenseth, who has finished second in each of his last four XFINITY Series starts. “We were out front in Chicago and had the better car, but second is the (next) best place to finish, I guess. Joey Logano finished third, followed by fourth-place Ty Dillon and fifth-place Regan Smith. 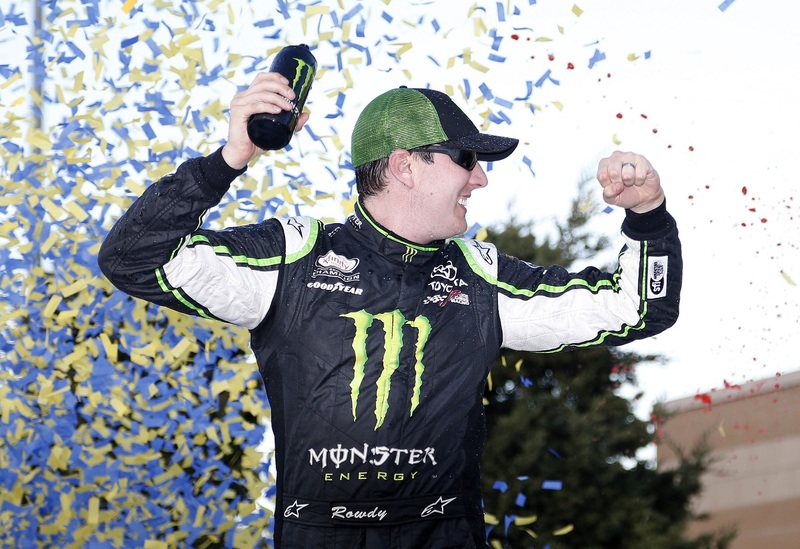 Busch would like nothing better than to duplicate his victory in Sunday’s Hollywood Casino 400 NASCAR Sprint Cup Series at Kansas (2:15 p.m. ET on NBC). 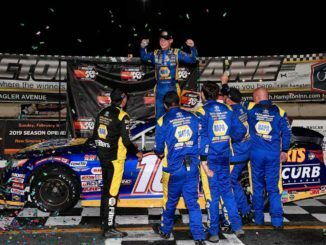 After a 20th-place finish last Sunday at Charlotte in the first race of the Chase’s Contender Round, Busch could earn a spot in the Eliminator 8 Round with the ninth XFINITY/Sprint Cup weekend sweep of his career (including his three-series sweep at Bristol in 2010). 1. (4) Kyle Busch(i), Toyota, 204, $80362. 2. (1) Matt Kenseth(i), Toyota, 204, $74147. 3. (10) Joey Logano(i), Ford, 204, $51553. 4. (5) Ty Dillon, Chevrolet, 204, $46468. 5. (3) Regan Smith, Chevrolet, 204, $40735. 6. (2) Chris Buescher, Ford, 204, $39801. 7. (12) Chase Elliott, Chevrolet, 204, $35943. 8. (15) Ryan Sieg, Chevrolet, 204, $33833. 9. (6) Daniel Suarez #, Toyota, 204, $33734. 10. (8) Brendan Gaughan, Chevrolet, 204, $32818. 11. (14) Darrell Wallace Jr. #, Ford, 204, $31338. 12. (18) Elliott Sadler, Ford, 204, $30784. 13. (16) Brennan Poole, Chevrolet, 204, $30230. 14. (23) Ross Chastain #, Chevrolet, 204, $29716. 15. (7) Kevin Harvick(i), Chevrolet, 204, $23577. 16. (9) Austin Dillon(i), Chevrolet, 204, $23041. 17. (17) Ryan Reed, Ford, 204, $28953. 18. (20) Landon Cassill, Chevrolet, 203, $28491. 19. (21) Jeremy Clements, Chevrolet, 203, $28280. 20. (13) Dakoda Armstrong, Ford, 203, $28568. 21. (19) JJ Yeley, Toyota, 203, $27957. 22. (22) David Starr, Toyota, 203, $27841. 23. (11) Brian Scott, Chevrolet, 203, $27705. 24. (30) Mason Mingus(i), Chevrolet, 201, $27595. 25. (25) Blake Koch, Toyota, 200, $27608. 26. (31) Eric McClure, Toyota, 198, $27347. 27. (34) Harrison Rhodes #, Dodge, 195, $27237. 28. (36) Joey Gase, Chevrolet, Engine, 187, $27115. 29. (40) Jennifer Jo Cobb(i), Chevrolet, Accident, 138, $20964. 30. (24) Cale Conley #, Toyota, Accident, 113, $27153. 31. (33) Korbin Forrister(i), Chevrolet, Accident, 103, $26697. 32. (26) Michael Self, Chevrolet, Engine, 95, $26586. 33. (29) BJ McLeod(i), Chevrolet, Handling, 79, $26470. 34. (39) Ryan Ellis(i), Chevrolet, Fuel Pressure, 53, $20358. 35. (35) Morgan Shepherd, Chevrolet, Fuel Pressure, 51, $20221. 36. (28) TJ Bell(i), Toyota, Electrical, 30, $24040. 37. (38) Timmy Hill(i), Chevrolet, Vibration, 25, $17040. 38. (37) Mike Harmon, Dodge, Engine, 20, $22040. 39. (32) Derrike Cope, Chevrolet, Engine, 14, $21040. 40. (27) Jeff Green, Toyota, Suspension, 3, $14040. Average Speed of Race Winner: 121.455 mph. Time of Race: 2 Hrs, 31 Mins, 10 Secs. Margin of Victory: 0.607 Seconds. Lead Changes: 7 among 2 drivers. Lap Leaders: M. Kenseth(i) 1-117; K. Busch(i) 118-151; M. Kenseth(i) 152-175; K. Busch(i) 176; M. Kenseth(i) 177-181; K. Busch(i) 182; M. Kenseth(i) 183-184; K. Busch(i) 185-204. Leaders Summary (Driver, Times Lead, Laps Led): M. Kenseth(i) 4 times for 148 laps; K. Busch(i) 4 times for 56 laps. Top 10 in Points: C. Buescher – 1,093; C. Elliott – 1,066; R. Smith – 1,060; T. Dillon – 1,057; D. Wallace Jr. # – 976; E. Sadler – 974; D. Suarez # – 962; B. Gaughan – 927; B. Scott – 922; R. Reed – 825.